Having originally intended to write this blog chronologically, I find I am too impatient to talk about the present! So this section of the blog is about my recent adventures, and later on I will revisit the past. It’s OK for movie-makers to jump around in time, so I don’t see why bloggers can’t do it. For the past couple of months I have been an Artist in Residence at Sturt Craft Centre, Mittagong, Australia. My studio is in the Weave Room, surrounded by loom weavers. I am working with both recycled and natural plant materials, making pieces for exhibitions (including my first solo show, planned for next year). Sometimes I combine the recycled and the natural… sometimes I go fully for one or the other. 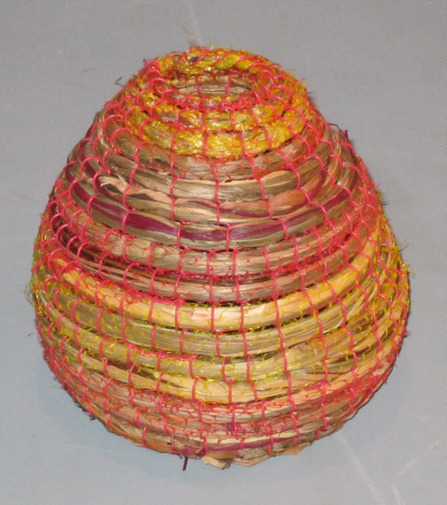 This recently made “Sunset Basket” combines plant materials with telephone wire and onion bags. “Journey to the surface of the earth” combines Cordyline australis with chip wrappers and telephone wire. This is my fourth artist residency, and I find it’s a great way to focus the mind and bring forth a cohesive body of work. The themes that are currently occupying/ obsessing me are to do with human impacts on the natural world. Since the materials I work with often comprise the contents of rubbish heaps or street litter, I am making pieces that refer to the ultimate fate of plastic bags etc. They end up blowing around in the street like autumn leaves, or accumulating in the ocean where they break down (into tiny particles, but this is not the same thing as biodegrading). How will these tiny plastic particles affect the health of the small organisms that ingest them? Whether or not they then migrate up the food chain is something that scientists are only just beginning to study. It is disturbing to think about. I first started using plastics while doing another artist residency at the site of a former landfill area. More on that later. 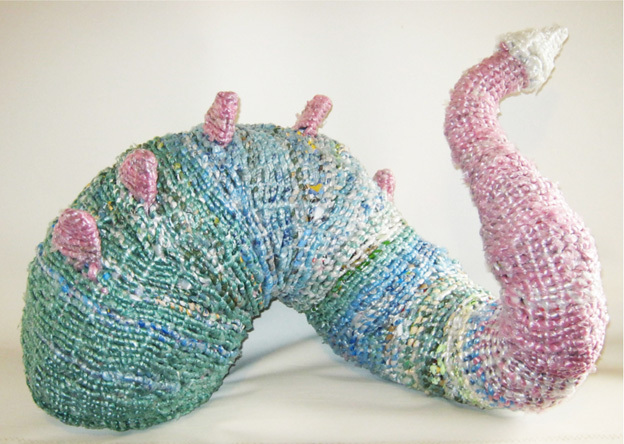 Some of the pieces I am making are essentialy sea monsters arising from my imaginings about the dangers of plastic in the ocean. Like the sea monsters of old, they may ultimately prove to be mythical creatures. I hope so. “Disenchantment under the sea” is made from the plastic wrap that newspapers are delivered in. This plastic comes in different colours in different parts of Australia. “Leviathan”… a plastic sea monster. 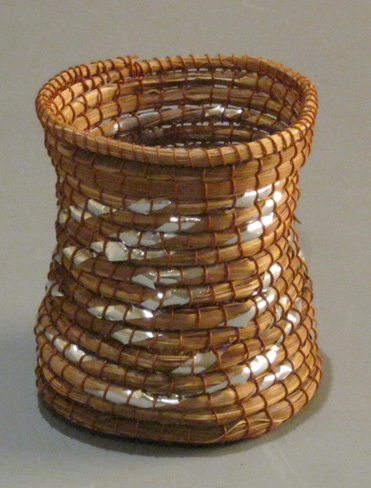 Plastic as a material is interesting to work with in basketry. Plastic bags don’t have fibres, so lack the structural strength of plant materials… but on the other hand they are stretchy, shiny, colourful, and need no special preparation. 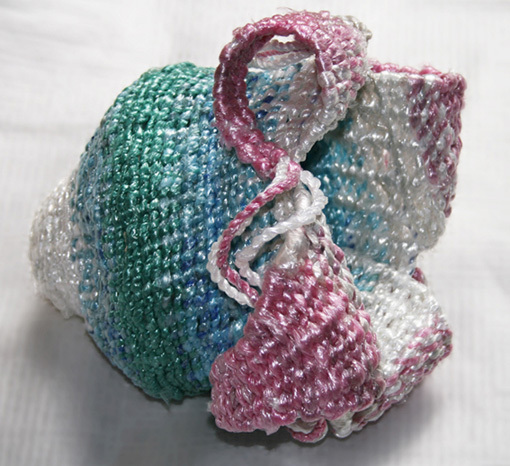 I avoid using recently made biodegradable plastics, as I want my work to last a long time. After peak oil really kicks in, whenever that may be, perhaps items made from old style plastic bags will become rare, desirable and expensive! In conclusion, since the plastic bag has threatened to kill off the traditional basket for most of the last century, I enjoy the irony of a plastic bag ending its useful life as a basket. the thought i really hate about plastic bags is that when they end up in the ocean, sea turtles sometimes think they are jellyfish and eat them. this eventually kills the turtle. very sad. your work is wonderful and very organic, which is another interesting irony.